The 100th "Desktop Madness" post features wallpaper images based on my favorite drink - coffee! It’s been a while, but it’s finally here – the 100th installment of Desktop Madness. And what better way to celebrate than with a bunch of wallpapers featuring the drink that keeps me going each day – COFFEE! So here you go – a bunch of coffee-themed wallpapers. Thanks for sticking with me through 100 of these posts, and enjoy! This installment of Desktop Madness features a nature photograph which was good enough to fool me into thinking someone else had taken it! Geez, have I really done 99 of these things? Wow. Today’s wallpaper has a slightly amusing story to it. As you might know, I use John’s Background Switcher to cycle randomly through my entire wallpaper collection. It took a few minutes for me to remember that actually, that was a picture I’d taken! So anyway, here’s the photo that inspired this post. Enjoy! 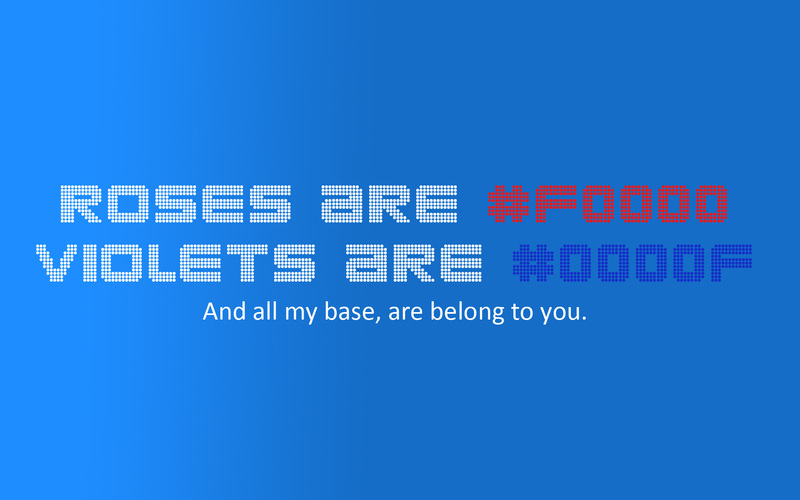 Roses are #F0000, Violets are #0000F ... you know the rest. Happy Valentine's Day. Can’t believe I’d never posted this one before. Happy Valentine’s Day, Internet… may your memes never fade!